Just past noon, Anna Chernova, a 68-year-old retiree, pushed her black metal shopping cart into an Aldi store here. After arriving from Russia 16 years ago, Chernova regularly shopped at conventional supermarkets like Dominick's and Jewel, but no more. "They're too expensive," Chernova says, clutching her shopping list with one hand. Now she visits Aldi once a week, drawn by the deep discounter's $2.69 1-gal. jugs of milk and 33-cent boxes of salt. "I've got to save my pennies," she says, heading into the store. Chernova certainly isn't alone. Spooked by the gravest economic crisis in decades, Americans are curtailing their spending. They're making fewer trips to supermarkets and migrating from grocers like Albertson's and Whole Foods to deep-discounters like Aldi and Save-a-Lot. And it's not just retirees like Chernova. These spartan bastions of private-label goods are looking a lot better to a broad range of shoppers. "Prior to the economic slowdown, we were prospering. But now we're seeing customers looking to save money, and our foot traffic has increased," says Jason Hart, president of Aldi US, based in Batavia, Ill. "There seems to be more demand for our stores, and people don't want to sacrifice quality." Aldi arrived in the U.S. in 1976, hoping to replicate a business model that proved successful in Europe. With U.S. food inflation then in the double digits, the company's timing couldn't have been better. Aldi was one of the first so-called box or no-frills stores, grocers that featured rock-bottom pricing by offering a limited inventory and squeezing out all unnecessary costs, from coupons to butcher shops to fancy displays. For starters, Aldi stores are typically just 10,000 sq. ft., far smaller than the 80,000-sq.-ft. stores grocers like Whole Foods have recently opened. The relatively small size has helped Aldi penetrate urban markets, where real estate is generally more expensive than in suburban locales, and also allowed the company to carve a niche in neighborhoods that supermarket chains neglect. Operating costs are as spare as the rest of the place. At any given time, there are fewer than five staffers inside an Aldi store. On a recent afternoon at a location on Chicago's North Side, for instance, there were just two cashiers, an employee replenishing milk shelves and a security guard greeting customers. Customers are encouraged to bring their own shopping bags, reducing the need for plastic bags, which are sold at 10 cents apiece. 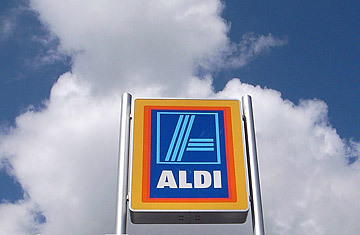 More fundamentally, Aldi concentrates on selling core, high-volume grocery products, like ketchup, cereal and coffee. Want a choice? Forget it. By offering a single brand, usually a private label in a single size, Aldi executives say they can substantially undercut conventional retailers on 90% of the products the store sells. Nor do customers have to make any trade-offs in buying private labels. Consider the sleek, dark 16.9-oz. bottle of Ariel Extra Virgin Olive Oil ($4.29). Or the 13-oz. box of Fruit Rice cereal ($1.69). "You wouldn't be embarrassed to have that on your counter," says Bill Bishop, a retail consultant. The time appears ripe for deep-discounters, and Aldi is on an expansion tear. Last year, Aldi generated some $5.8 billion in U.S. sales, up from $5.3 billion in 2006, according to Supermarket News, an industry journal. It now has about 950 stores in 29 states and plans to open more than 100 stores in the next two years in Connecticut, Missouri and Texas. The company will have opened 100 new stores by the end of the year, double the number opened last year. Aldi is also making a big push into central Florida, including cities like Sanford. The city's economic development director, Robert Tunis, tried for years to lure grocers to his city, about a half-hour's drive north of Orlando. Sanford's demographics are attractive: its population grew 27%, to about 50,000, between 2000 and 2006. Within a few miles of downtown, Tunis says, are households boasting annual incomes of $30,000 to $250,000. That's partly what has attracted retailers like Target, Wal-Mart and Lowe's. "You name the retailers, we've got them," Tunis says. "But we've been underserved by grocers." Aldi has solved at least part of that problem. Tunis was among the first to arrive at the grand opening of an Aldi store in downtown Sanford, next to one of Seminole County's largest shopping centers. Now he's hoping other grocers will follow Aldi's lead. "There's really no equivalent at the moment," he says. Deep discounters like Aldi can challenge both conventional supermarket chains as well as Wal-Mart, America's largest grocer. Indeed, Wal-Mart ultimately found it too hard to compete in Germany, where deep-discounters are firmly entrenched, and left. "Both Aldi and Save-a-Lot are winning big-time," Bishop says, "because they have an extreme value proposition  which is appealing at a time like this."